Most of the recitation questions sent in this week were basically bar arguments, and almost entirely ones I had covered before, or were more recently covered by the excellent Jessica Hagy. But after reading Kevin's suggested bracket, how could you not imagine a bad science fiction movie, most likely starring the immortal Lorenzo Lamas? Wouldn't you root for lobster but still kind of expect the hippo to win? Wouldn't this be an even better premise than Mega Shark vs. Giant Octopus? 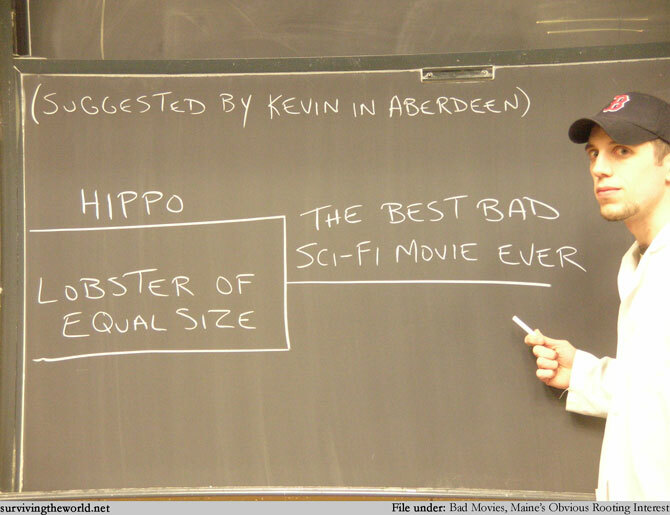 Man, I'd love to watch "Hippo vs. Lobster of Equal Size". If you've got a recitation question rattling around in your cranium, send it on in. That's how the magic starts. How far have you gotten with the new crossword puzzle homework? Have you tried Justin's new daily puzzle?